by Fr. Sergius Chetverikov- 469 pgs. 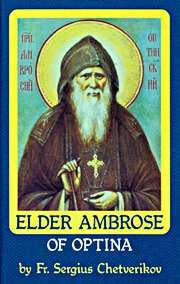 Elder Ambrose (1812-1891) is considered the pinnacle of Eldership in Optina. Through his humility, self-sacrifice, and total love the Lord blessed him with spiritual gifts by which to heal suffering souls. So great were his gifts that hundreds of people flocked daily to his humble cabin in central Russia.